The 2012 race season opened with Wildflower, in central California. A good excuse for a west coast visit, and the perfect opportunity for us to celebrate the awesomeness of the number Three. Three sports, three kids - we got to share the race, and everyone knows sharing is what siblings do best. Now in its 30th year, Wildflower has a reputation for being a tough course with a competitive field, but is also known as the 'Woodstock of Triathlon,' with its live bands and the tradition of camping and partying. It took us awhile to locate a patch of land to claim as ours. There aren't proper campsites mapped out, so people have squeezed themselves in anywhere and everywhere. The scene reminded me of an overcrowded Florida beach during tourist season. Down in the festival area, bands played, vendors sold GIANT TURKEY LEGS and ice cream - it was like a carnival. The Naked Run is a Saturday tradition, a celebratory romp for those who had finished the Long Course race that afternoon. We heard the cheers approaching around dusk, and from the campground, herds of clothed people dashed for the road, "the Naked Run is coming!" We gathered roadside to cheer on all those hearty individuals with fresh sunburns and tanlines that ended mid-thigh, for whom 13.1 miles was simply not enough. Cinco De Mayo revelry continued through the evening as a full moon shone so bright we didn't even need a lantern. If the Sunday Short Course athletes were concerned about being well-rested that night, they certainly never spoke up about it. Note to self: next time, earplugs!! Relays were the last wave to start, so naturally Nik and Whitney were going to have to spend a lot of time passing people on the bike and run. My swim was great, the water was perfect, and before I knew it, my work was done. Nik has done the bike portion of the relay before, so he knew what to expect. But this was Whitney's first 10K - her first timed race of any kind, actually (we don't count "running" the Bay to Breakers dressed as a panda in a beer helmet). She tore up my Wildflower run record, coming in almost a minute faster than I did in 2008. Nik and I joined Whitney in the finish chute so the three of us could finish as a team. It's pretty fun sprinting the Finish when you didn't actually run the 6.1 miles that came before it! 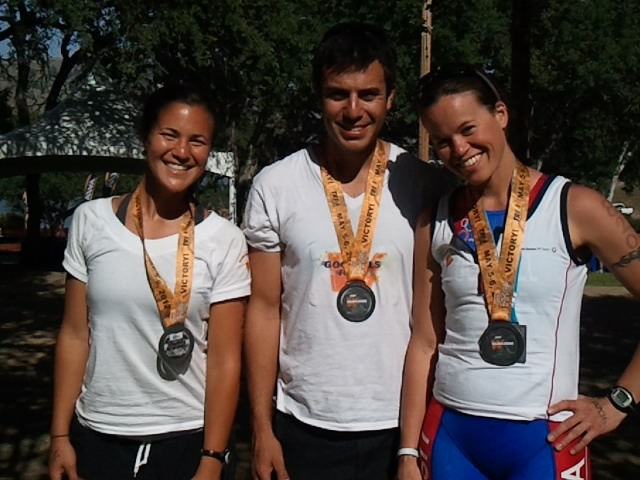 We ended up on the podium, placing 2nd in the Open Mixed Relay, 3rd Overall Relay (of 72 teams). Goodells Rule!